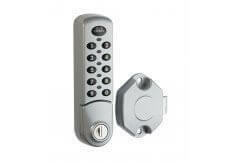 The Lockey digital combination lock 3780 with slam latch is an Electronic Push button cam lock. The slam latch automatically locks the lock once it has been pushed to close. The 3780 with slam latch lock is also compatible with the RAS remote allocation system.